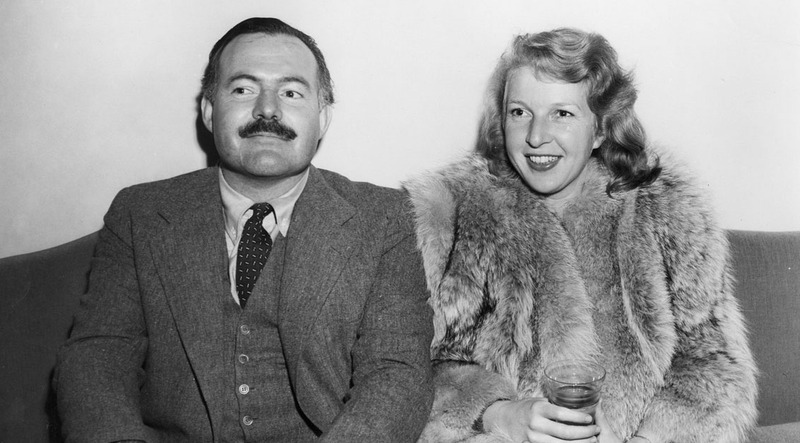 Martha Gellhorn and Ernest Hemingway headed to Spain to help the Loyalists during the Civil War. Gellhorn was to transform into one of the 20th century’s best war correspondents. Hemingway needed to have his romanticism crushed to write a masterpiece. They are two figures in Amanda Vaill’s HOTEL FLORIDA. This conversation examines how the Civil War changed not only the trajectory of Spain, but the future of world culture. Amanda Vaill is most recently the author of Hotel Florida. Subjects Discussed: Household accidents, Robert Capa’s “Falling Soldier” and various claims attesting to its authenticity, staged photography, Capa’s origins, Ernest Hemingway’s bluster, his journalistic weaknesses, Virginia Cowles’s bravery, the dubious qualities of To Have and Have Not, John Dos Passos, journalistic skepticism, Hemingway’s disillusionment with the Spanish Civil War, Martha Gellhorn, Gellhorn’s 1983 interview with John Pilger, Gellhorn’s condemnation of government, Gellhorn’s relationship with Eleanor Roosevelt, Gellhorn making up the facts (fabricating a Mississippi lynching) for her news story, “Justice at Night,” Henry Luce’s attention to Robert Capa, what coverage of the Spanish Civil War was real, Spain as the front line against Hitler, constraints of journalists on the Nationalist side, whether or not any amount of art and journalism could have averted the fate of Spain, the Non-Internvention Agreement, American isolationism, the civil war within the Civil War, left-wing factions squabbling against each other, Arturo Barea’s The Forging of a Rebel, Barea as a late bloomer, Barea’s stint as the Unknown Voice, confidence and post-traumatic stress, how to determine the precise words that floated through someone’s head or mouth from seven decades ago, Hemingway’s The Fifth Column, The Spanish Earth and the current print status of Spain in Flames, Archibald MacLeish and Contemporary Historians, Inc., orphan business entities, the brawl between Orson Welles and Hemingway during voiceover recording sessions, the fight between Hemingway and Max Eastman, what women thought of all the needless male fighting, George Seldes’s reception in the Spanish Civil War, Henry Buckley’s The Life and Death of the Spanish Republic, the legend of the luggage that Martha Gellhorn took to Spain, Joan Didion in El Salvador, Love Goes to Press, the American matador Sid Franklin, Ilsa Kulcsar, Gellhorn’s bravery and influence upon Hemingway, the recent Russia press gag on bloggers, comparisons between the Spanish Civil War and Syria, photographs as Instagram in slow time, whether there’s any Hemingway again, and contemplating J.K. Rowling going to the Crimea to write a novel. Correspondent: You’re doing okay, I take it. Vaill: Except for my broken finger. Correspondent: Oh, you broke your finger? Vaill: Yes, I did. I had one of those household accidents. I tripped over my shoes. Correspondent: And, of course, it’s the right hand as opposed to the left hand. Vaill: Of course it is. So I cannot write and I cannot shake hands and I cannot sign my name. Except that it is getting better so I can now do that. Correspondent: Although you have a good shot at taking over Spain. Correspondent: The Spanish Civil War. We have many characters and many figures and I’ll do my best to get to all of them. But let’s start with good old Robert Capa. 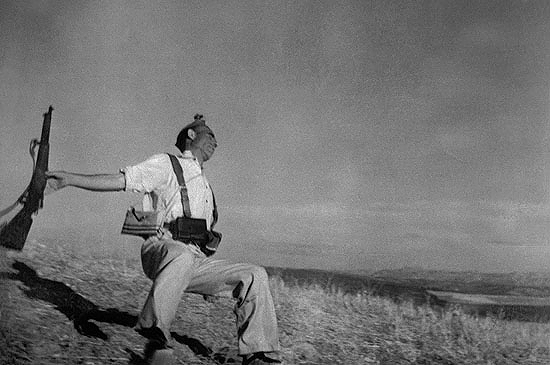 One of the fascinating and oft argued issues in photography is, of course, Robert Capa’s “Falling Soldier” — the picture of the militiaman on the Andalusian hill falling to his death in battle. Some have contended that it is fake. Some have contended that it is real. Some have, as you have, tried tracking down interviews. You tried to find an NBC Radio interview with Alex Kershaw on October 20, 1947 in which Capa claimed to have killed the miliciano. But the purported truth of the story behind the photo is almost as murky as the purported truth of the photo, which in turn has us contending with the purported truth of the War. So how do even begin to come to terms with the photo — in terms of scholarship, in terms of authenticity? And how does the struggle affect our ability to wrestle with the complexities and the ideological involutions of the Spanish Civil War? Just to start off here. Vaill: Yes. There is a big difference. Something that is faked is in some way manipulated so that something that is not true can be made to be true. Something that is staged is something that is perhaps not quite as extreme as something that is faked. And you have to bear in mind that in 1936, when this photograph was taken, there was no history of war photography at all. No one had taken live action photographs on a battlefield. Matthew Brady took pictures of corpses, which he manipulated and moved around so that they would be in a pose that he liked. In World War I, you couldn’t go on the battlefield. You were not allowed. And furthermore there was no equipment that you could take on there. You have big cumbersome cameras and slow film. And it was only in the 1930s, when you had 35mm film and cameras that could accommodate it, that you could take your camera onto the battlefield. So there was no rulebook for how you handled photography in wartime and no one was used to allowing photographers to be where there was combat. So when Capa and Gerda Taro, his lover and cohort in photography, came to Spain, they at first were not even allowed to go onto the battlefield. They were only given access to troops behind the lines and they tried to make them look good. But this was just not happening. They couldn’t get anything that looked like real battle. And finally, when they were near the area of Córdoba, on the Córdoba front. They had this chance to take photographs of a group of soldiers and Capa has told many stories about what happened and how he got this shot. He was an inveterate tale-teller. He was a real entertainer, Capa. He loved to charm and entertain people. Correspondent: He felt compelled to create his own legend. Vaill: He totally did. And he did. He created his name. He was born Andrei Friedmann in Budapest. So he created a whole persona of Robert Capa, the famous photographer, and he created not just that, but this legend of himself that he felt perhaps compelled to live up to. In 1936 though, remember, he’s 22 years old. He’s just a kid. He doesn’t know what he’s doing really. And it is my belief, based on interviews — they aren’t even interviews; conversations that he had with those close to him at times when he, in fact, was not on. The conversation that I base most of my reconstruction on this incident on is one that was with a friend. He wasn’t trying to entertain this person. He wasn’t showing off for an interviewer. He was confessing something. And what he confessed was that a real man had been killed by something that he had done and he was conscious-stricken about it, which is the kind of thing that really squares with the portrait that I received of Capa. That Capa was a very kind, very generous, very loving person and easily hurt by things and didn’t want to give pain to others. And that this thing had happened, I think, was horrifying to him. Correspondent: Since we are talking about various artists who came to Spain and essentially either set themselves up as legends or became legends later, let’s move naturally to Ernest Hemingway. For all of his bluster about being a “real man” and a “real journalist,” he didn’t actually cover Guernica in April 1937. And he didn’t mention this devastating battle in his dispatches from Spain. Virginia Cowles, on the other hand, she headed into the Nationalist zone and not only covered it, but did so when a Nationalist staff officer said, “You probably shouldn’t be writing about this.” So you write in the book that Hemingway may not have thought this important enough, but why do you think he ignored it? Was he just not that thorough of a reporter? Vaill: Well, actually, I hate to say this, but he wasn’t that thorough of a reporter. For all that he had a great background as a gumshoe reporter back in the day, when he was at the Kansas City Star, when he was in Toronto, he was a newspaperman. He was on the city beat and he was the cub reporter sent out to cover fires and God knows what all else. But by the time he went to Spain, he had become a legend. And he was a legend, in part, in his own mind, as much as in the minds of others, and I think he got to the point where what he really wanted to do was to sit at the big table with the big boys and get the big story, and let somebody else worry about all the little details. And in this case, Guernica happened in the Basque Country. It was in a zone that it was almost impossible for him to get to without great difficulty. Correspondent: But that didn’t stop Cowles. Correspondent: I will confess that your book had me finally, after many years, reading To Have and Have Not. Correspondent: I had been avoiding this for a long time and, as it turns out, rightfully so. Brilliant in parts, terrible in others. I mean, was Hemingway just not up to snuff during this particular period? Vaill: I think he was struggling. And I think that many writers do. They reach a period where they’re trying to break through to some other level and they’re not comfortable. The instrument isn’t sharp in the way that they want it to be sharp to do the work that they suddenly have decided they want to do. Hemingway after writing two extraordinarily well-received novels and an amazing bunch of short stories and maybe two of his, I think, finest works — “The Snows of Kilimanjaro” and “The Short Happy Life of Francis Macomber.” I think he was looking to do something different. The ’30s were a period of great relevance. The engagé writer was what you were supposed to be and he hadn’t been. And even though he scoffed at a lot of this stuff and said that he didn’t want to get that involved in politics and he didn’t want to hue to any -isms of one kind or another and all he really believed in was freedom, he couldn’t help noticing, particularly when his friend John Dos Passos ended up on the cover of Time Magazine in the summer of 1936, that writers who were writing about the big political themes were getting a lot of attention, the kind of attention he had always gotten, and I think he was looking for some way to do that and To Have and Have Not represented that kind of fiction for him. He wasn’t comfortable writing it, I think, and I think that was the problem of it. Correspondent: Speaking of Dos Passos, I felt tremendous sympathy for this poor man. I mean, he comes to Spain. He’s looking into the mysterious disappearance of his friend, Jose Robles Pazos, and he’s spurned by Hemingway. Correspondent: Hemingway is well-connected with the Loyalists and he tells Dos Passos, “Don’t put your mouth to this Robles business. People disappear every day.” Which is an extraordinarily callous statement. Why did Hemingway have difficulties getting around his romantic vision of the Republicans? Why couldn’t he ask the difficult questions that Dos Passos had no problem in investigating? Vaill: Well, I think it goes back to Hemingway’s wanting to be at the big boys table. Vaill: And he was. We’ve seen some of this same problem with journalists in our own day. The New York Times‘s Judith Miller, for example. And other writers writing about our involvement in the Iraq War, they wanted to just take the story that somebody wanted to hand out. Because that person was well-connected and high up in a tree. Correspondent: And that trumps any journalistic integrity. Vaill: Or any journalistic — I think it would be — doubt. Just the feeling that, oh wait. Vaill: Maybe I can take this story. Vaill: Your skepticism instrument is just not working when that happens. It’s lulled into some false quiescence by all this access that you suddenly have. And I think that’s what really happened to Hemingway here. He was so in love with the access he had and he was so taken up with his passionate identification with the cause of the Spanish Republic, which I can certainly understand. They were the democratically elected government of Spain and a bunch of right-wingers wanted to nullify an election and just take things back to the way they were before. Correspondent: So in order to get over the crest to For Whom the Bell Tolls, an absolute masterpiece, he had to go through all these needless romance and this big review point and then he had to have his heart crushed. Vaill: And then he had to be disillusioned. And I think the problem for him was — yes, exactly, he did have his heart broken in a way. And For Whom the Bell Tolls came out of that feeling of disillusionment. He called not just what had happened in the Republic, but also what happened at Munich — the whole thing and the dismissal of the international brigades from Spain. All that to him was what he called a carnival of treachery on both sides. And that’s pretty strong language.